We have been known to dabble in a bit of gaming from time to time and one of the places we play is Gaming DNA in central Hamilton. William, the owner, pulled us aside one day and asked if we could take a look at his logo. He had just moved his store to a new location and wanted to mondernise it before putting up signage and printing new business cards. At the top of his list was removing the background and updating the colours. As you can see above, nothing was working, so we asked William if we could have a go at rejiging the logo. We wanted to keep the basic shapes the same but move the elements around so there was no overlaping of icon and text. We also chose a more modern font and tackled the colour scheme again. William and his team were really happy with what we came up. What do you think? We’d love your feedback on the logo we designed for Gaming DNA. 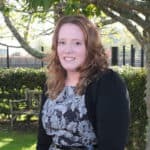 With a wealth of experience involved with project management and working in the retail and online sectors Helen is our lead eCommerce expert. When she's not in the office, Helen enjoys being a mum to the couples two children, baking, crafting and running her side hustles.